Product Key Finder is an extremely simple but very functional free key finder. There are no options at all in Product Key Finder. In fact, there are only three buttons in total. However, I found that the program located a fair number of product keys and serial numbers. This review is of Product Key Finder v2.2.4. Please let me know if there's a newer version I need to review. 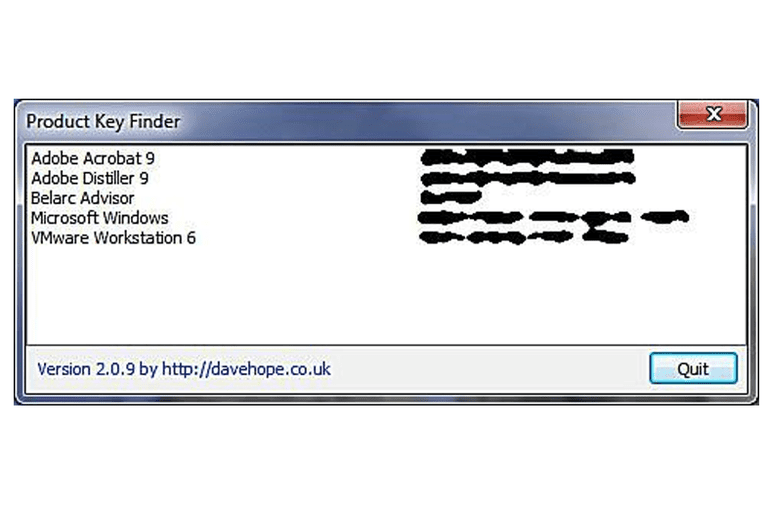 Product Key Finder is a very simple program. I haven't found an easier key finder to use. As soon as Product Key Finder opens, all product keys and serial numbers that the program can find are displayed — no scanning required. It doesn't get easier than that. While both a pro and a con, there are only a few buttons in Product Key Finder — a Load Hive, Save, and Quit button — no complicated options to confuse you. I think Product Key Finder is, overall, a decent key finder tool. It's certainly easy and it found several serial numbers that some more common tools have never found. Didn't find what you were looking for with Product Key Finder? Try another free key finder program or maybe even a premium key finder tool. Another key finder might be able to find the serial number or product key for your specific program.